Would like to easily see all the backlinks on a competing site? Also need info on where those links come from and what their SEO value is? 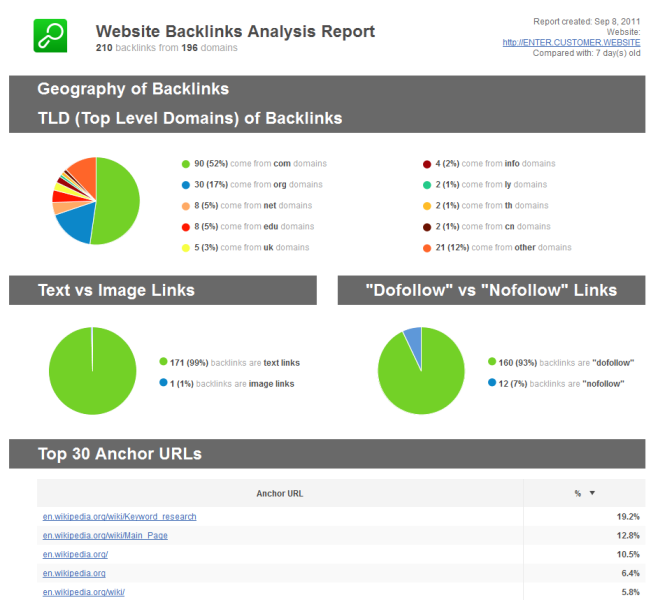 Get this data and more in a Backlink Analysis Report by SEO SpyGlass - the new-generation backlink checker. One cutting-edge backlink checker - 2 visual backlink reports. Grab SEO SpyGlass and see all the backlinks on a given site IN PLAIN VIEW. Learn each backlink`s anchor URL, PR, Alexa Rank, and more. See what countries they come from, whether they are dofollow or nofollow, and build an eye-candy graph that records your link-building progress over time. Why wait? Bring your link building to the next level - try SEO SpyGlass for free today! help you control your online sales. Online tool that converts photos to cartoons. You can use this tool on our website or embed it into your own website, it's free and easy. Your visitors will spend more time on your website editing their photos. This is a free keyword research program which helps you to find words that other web site owners associate with their web sites. Use this program to research additional or alternative potentials for your web business or find good bid words. What`s the easiest way to track rankings and report progress? Power-charge your SEO campaign with Rank Tracker SEO tool. Choose from 19 methods of keyword research, 314 SEs to track keywords in and 6 types of SEO reports. Grab your free version now!